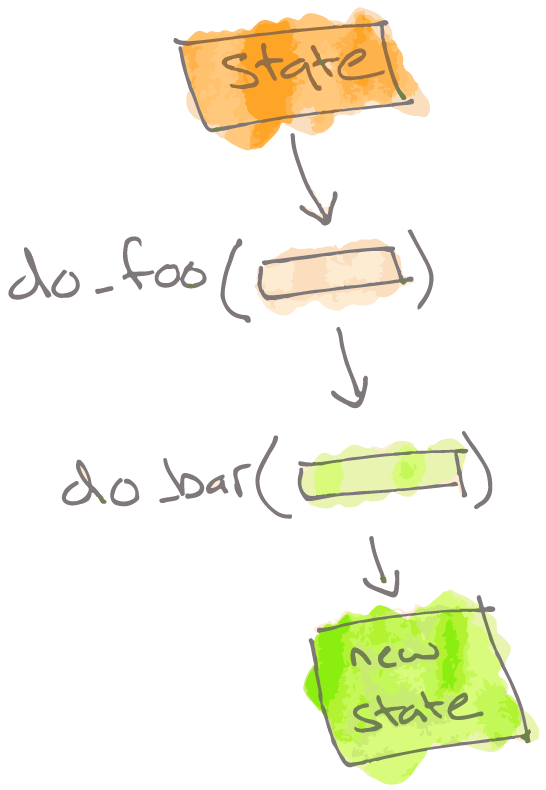 My recent dives into Elixir have been changing how I write software. More and more I find myself writing in a functional style, even in languages where its not the norm. As my style of programming changes, I find myself re-using patterns and ideas across many different languages. This article is about one of the patterns I use most often; interestingly, a pattern without a clear name. As my friend Dean Radcliffe pointed out, I'm probably describing a fluent interface as described by Martin Fowler. Today I learned. I often find myself wanting to chain together many function calls, passing in the results of previous calls into the next function in the chain. Sometimes, the next function in the chain only needs the result of the previous function. Sometimes, it needs the result of a function further back in the chain. The get_user function takes in the sender’s phone number and returns a corresponding user object. The get_response function takes in the sender’s text message and returns a response. send_response will take in a response and the user to send that response to. This is a fine solution. However, we’re binding user and response for no other reason than to pass them into send_response. Additionally, if our methods evolve over time to need more inputs, or more intermediary values, our function calls will get more and more tangled up. Instead of writing each function to take in exactly the arguments it needs, and returning a single value, let’s broaden our scope. Let’s create a larger, all-encompassing state object that will contain all inputs, intermediary values, and outputs of our function chain. There are lots of names that we can throw at this pattern. Some of them stick better than others, but I’m not fully satisfied with any of them. Is there a generic name for building a large, all encompassing state object, and then passing it through a lot of different functions that might only work on a subset of that state? What Plug does, for example. I find myself doing that kind of thing a lot, and I wonder if there’s some kind of name/pattern that describes it. Yeah, maybe. I’d describe it as maybe DI + method chaining. DI seems like a weird thing to talk about in a purely functional setting. Of course dependencies will be injected. I was trying to look at “popular" non-Elixir projects (like Redux or Om) which use the same concept to see if they identify the pattern by a name, but I’m not seeing anything. Dependency injection (DI) might apply in a way, but I usually think of dependency injection in terms of passing around functionality, not data. In a pure functional context, everything could be considered dependency injection in that sense. I mentioned “method chaining”, which seems to describe a nice side-effect of the pattern, not the pattern itself. Maybe the best pattern name would be “Middleware”, as seen in libraries like Express, React, and Plug. The pattern used by these libraries is exactly what I’ve been describing, but I’m not sure about the name. The term “middleware” was originally used to describe something very different than what we’ve been talking about. On top of that, there’s some disagreement amongst software developers as to whether “middleware” is the term we should be applying to this pattern (or if this is even a pattern at all). Either way, I’ll probably refer to this pattern as middleware when talking with other developers, and I’ll definitely continue using my favorite pattern without a name. This article was published on January 30, 2017 under the Elixir tag. For more articles, visit the archives. Also check out the work I do, and reach out if you’re interested in working together. Upgrade Releases With Edeliver – Edeliver simplifies the process of building and deploying upgrade releases for your Elixir and Phoenix applications. Playing the Game of Life with Elixir Processes – Explore the concept of life and death with Elixir processes by implementing Conway's Game of Life where each cell is a living Elixir process.